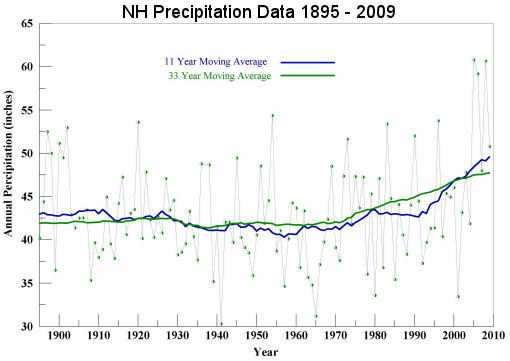 We hear all kinds off theories about global warming and precipitation with a majority of them predicting increasing drought. 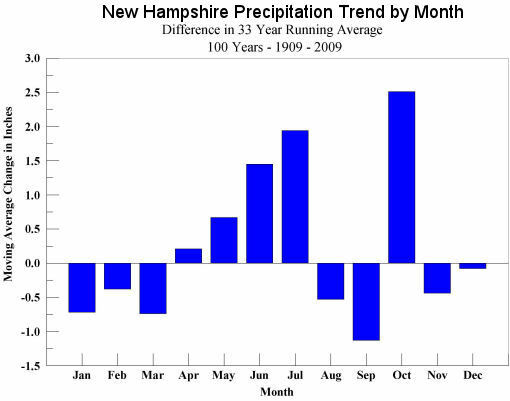 Here is what has been happening in New Hampshire. 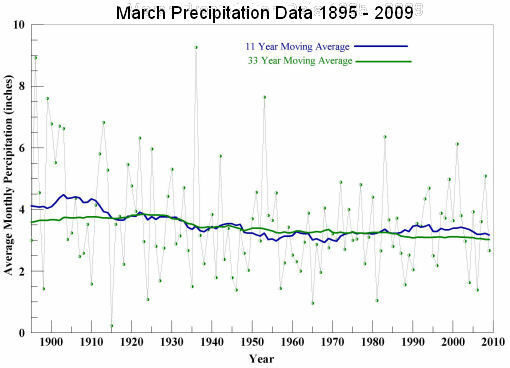 The monthly plots from 1895 to 2009 are below along with their calculated intermediate term (33 year) and short term (11 year) moving average. Here is what the last 114 years looks like. We don't see any drought here. 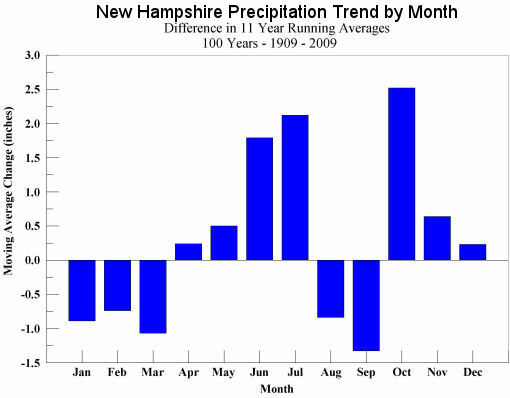 The annual increase in the 11 year running average is 6.14 inches and the 33 year running average is 5.07 inches. 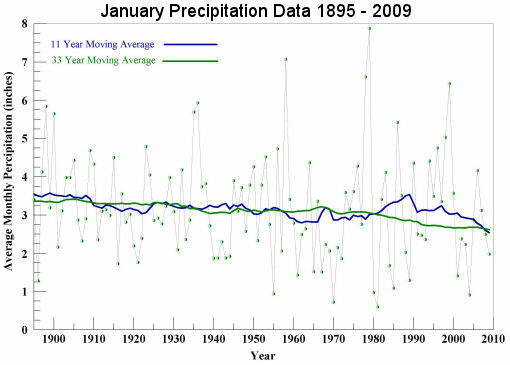 The January plots from 1895 to 2009 show the actual with trend lines. 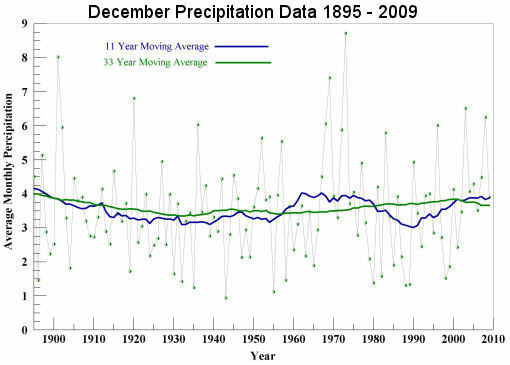 The moving average line for the 33 years 11 years are both showing decreasing precipitation. 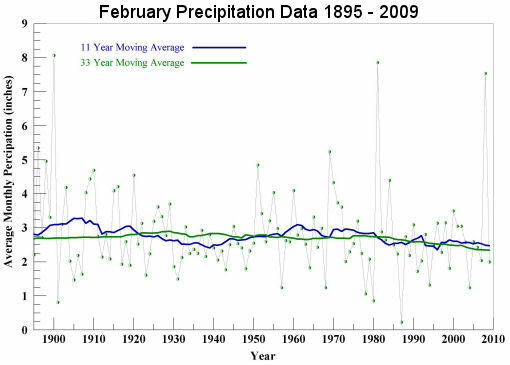 The February plots are showing a slightly decreasing trend for both the 11 and 33 year moving average. The March plots are showing a leveling out since the 1960's for the 11 year moving average and a slight decrease for the 33 year moving average. 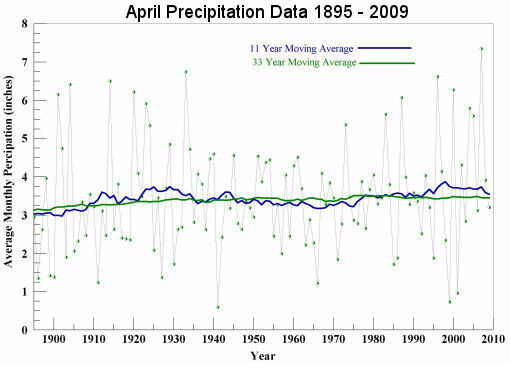 The April plots are showing a steady 33 moving average since about 1930. 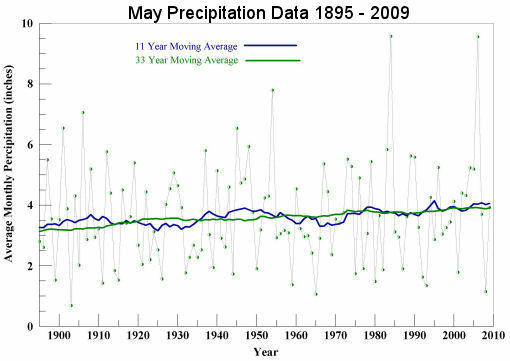 The May plots are showing a very slight increase in the 33 year moving average since about 1930. 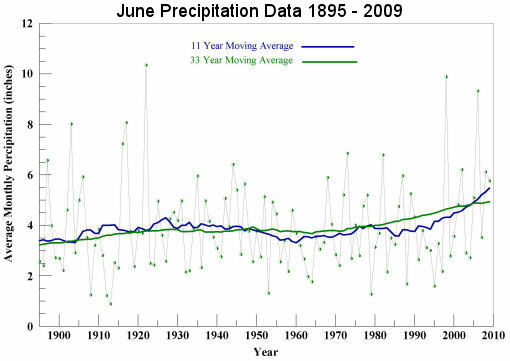 The June trend is currently showing an increase for both the 11 and 33 year moving average since around 1995. 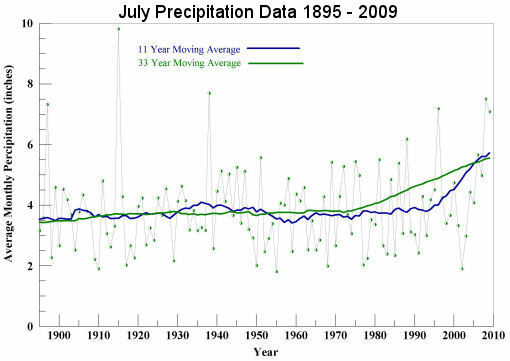 The July trend is currently showing an increase for both the 11 and 33 year moving average since around 1980. 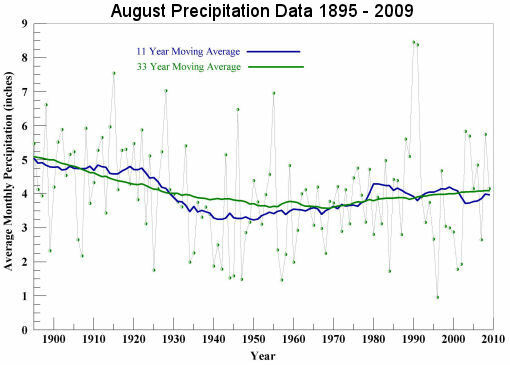 The August plots were falling until the 1950's and have been increasing since then. 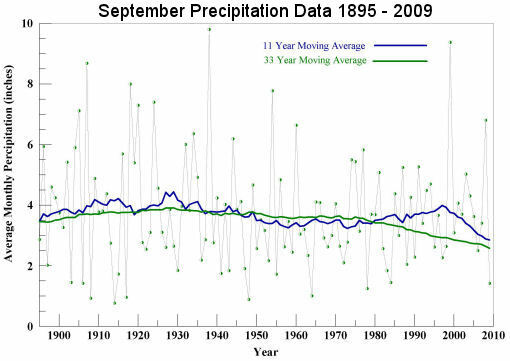 The September plots show a declining trend. 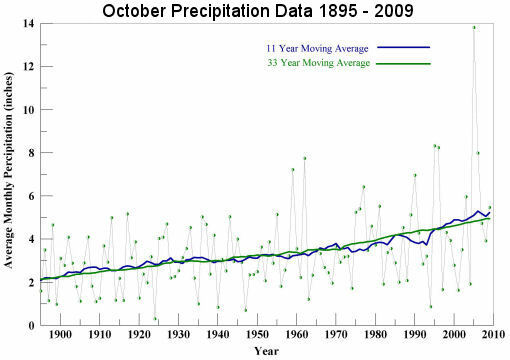 The October plots show a steady increase for the full data period. 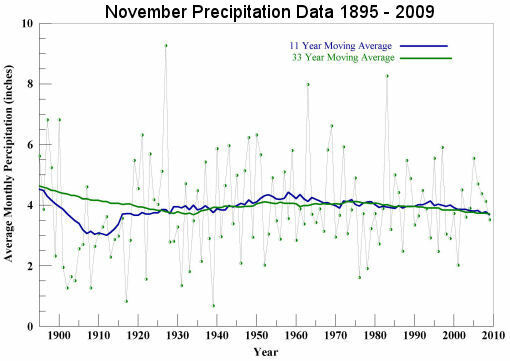 The November plots show a slight declining trend since about 1970..
And finally the December plots appear to have a some long term cyclical characteristics.